The EuroCave Rolling Tasting Shelf** rolls out and holds 20 bottles* upright for easy access. Wood trim is the darker Sapele Wood. This shelf is trimmed with a dark Sapele Wood. Please check the description of the EuroCave Wine Cellar it will be used in as more recent EuroCave shelves use Beech. Feel free to call 800.377.3330 and speak to a Consultant if you have any questions. 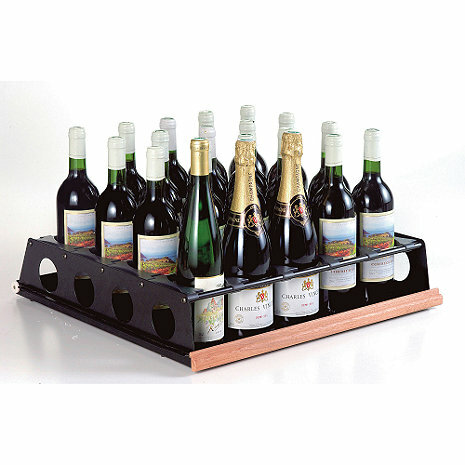 The EuroCave Rolling Tasting Shelf** rolls out and holds 20 bottles* upright for easy access. There are no tools required for installing, moving or removing the shelves. *These are for the EuroCave Performance (excluding Built-In), Comfort, Digital Comfort, Elite and Premier series. BEST ANSWER: This shelf is meant to be placed in the Eurocave Comfort, Performance and Pure Lines. These do not fit into the front vent Eurocave lines such as the Performance 59 or Performance 259. Can this shelf be used to secure whisky (or other spirits) bottles? BEST ANSWER: Yes, provided that its not some fat bottle. Standard btl is no problem. I am using it to store whisky too. Although that is not shelf's original intent, I do not see why this wouldn't be able to handle the most popular shaped Whiskey bottles.